Lockers Hall was built in the early 1700s. In 1787 John Ward, a wealthy businessman purchased it, beginning the process of acquisition of much of the land of Mill Meadows. Between 1805 and 1812 he also acquired Gatwick House, Greens Farm and a row of cottages facing the northern boundary of South Green. In 1839 records show John Ward was living at Lockers but by the 1841 census he had left. 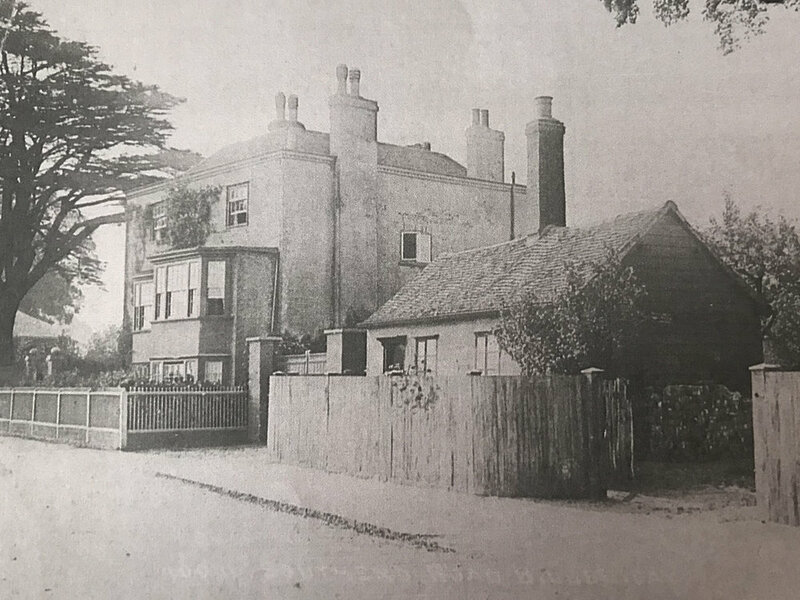 It is then unclear from historical records who was in residence up until the 1871 census when we can see Richard Wyatt, Independent Minister of Billericay in residence, the 1881 and 1891 census showing Rev JD Hoystead, Rector of Ramsden Crays living there. In 1874 the house was labelled by the Ordnance Survey map as ‘Grammar School’. Ownership passed through the Ward family, first to John Ward’s son Henry Ward (1801-1872) and then onto his son John Henry Ward (1849-1911). John Henry Ward’s brother, Alexander Ward (1852-1907), moved into Lockers in 1894. In 1895 he married Florence Emily Cunningham Scott (1860-1943) and Lockers became their family home, they had no children. Alexander remained in residence until his death in 1907 at which time ownership of the house passed to John Henry Ward’s only son, Henry Ward, with Florence Ward remaining in residence. We know that from 1908 until her death in 1943 Florence Ward employed Leonard Quartermain as a gardener/chauffeur who, as an employee was able to live rent free with his family at 1 Mill Cottage. In a survey carried out between 1910 and 1915 Lockers Hall was described as a detached lathe and plaster house, part brick, fairly old in very good repair, with three main rooms and a box room on the second floor, a drawing room, bedroom and a small single bedroom and box room on the first floor. The ground floor comprised an entrance hall, dining room, open portable stove, small library, pantry, large kitchen with range. It had a cellar and lean to scullery at the side with a shed, toilet and water laid on. It included 8.75 acres of land. After Florence’s death the property was leased to various tenants including Ms Harrington Hawes and Mr REH Coles until 1962 when it was sold. Lockers Hall can be seen today on Southend Road facing the fields from the opposite side of Southend Road. A 200 year old cedar tree stands in the front garden. It is a three storey, Grade II listed house.